Ashley’s third solo release continues this avant/minimalist composer’s exploration of the subtleties of sound construction and the craft of aural reconstruction. 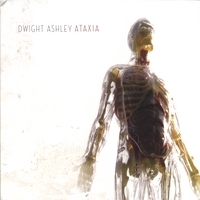 As with previous efforts, Ashley uses a minimum of technology (primarily guitar, synthesizer and Eventide Harmonizer) to convey an “auditory experience…of disaster, disconnection and loss.” Ataxia features a murky, sub-aqueous production that recalls the work of Daniel Lanois, immersing the listener in an ocean of sound permeated with disembodied samples, cacophonous industrial machinery and drifting synthesizers. “When the Waters Came” and “Black Swamp, Bright Sun” are particularly effective in evoking strange portents of apocalyptic doom. The eerie “Circus of Sharp Toys” employs an almost orchestral framework to achieve a kind of epic expressionist grandeur. Its deft fusion of industrialism and neo-classical elements conveys to the listener a sense of troubled response to the uncertain conditions of an ever-shifting ecosystem. Many of the pieces on Ataxia are downright haunting in their evocation of the Hericlitean principle of permanent change, though at gradual rates of velocity that remind one of Philip Glass’ insistence on continental drift as applied to sound composition. Thus, “As We Became Complacent” and “Our Dark Shallow Spoil,” while they deluge one in a virtual sea of constantly shifting tonalities, also orient the listener in a vast sonic drama being orchestrated at the grandest level of unconscious memory and desire. Ashley’s understanding of the dictum that what is heard just below the surface of hearing itself is just as important as what is physically is a key element in both understanding and appreciating his approach to sound construction and development. The somber but stately gavotte of “Withdrawal of the Many” and the impressionistic “Days into Years” both testify to Ashley’s ability to delve into the psychoacoustics of the heart and soul without sacrificing the human touch that is the mainspring of all artistic endeavour.